My name is Cora Eddy and I was born and raised in Bellingham, Washington. Shortly after I was born, I became ill in the hospital with a Group B Strep meningitis infection and then hydrocephalus, which is known as “water on the brain”. Between the age of 21 days old and about two years old, I had seven Ventriculoperitoneal (VP) shunt placements before it was put in the right place for proper draining of the cerebrospinal fluid or “water”. Because of the repeated trauma at such a young age, I have grown up with long-term memory loss and bilateral hearing loss. 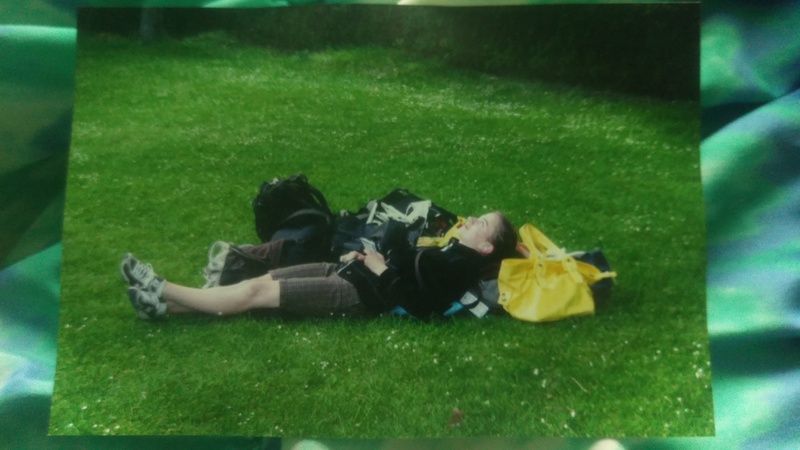 My first trip abroad was to England in the eighth grade. At the time, I had intended to take pictures with my digital camera. On the second or third day, the camera lens started to retract back in, like it is supposed to when turning it off but got stuck in the middle of the process. My camera was broken and useless. Knowing that long-term memory loss meant that much of the trip wasn’t going to last beyond my initial experience of it, I dug into my day pack and found the small notepad that my mom had thrown in for me to write the hostel address on in case I got separated from the group (which ultimately never happened with five chaperones and ten other classmates all keeping an eye on me). With the note pad I took extensive notes that were turned into journalentries during the down time that we had in the afternoon before dinner. Old-fashioned, handwritten note-taking has always been my go-to when I find myself in a situation where I need something I am receiving in a given moment for a future moment, even if that future moment is very nearby. I also deliberately leave objects or items in my way that may be needed later in the process of what I’m doing to avoid having to backtrackmyself. I went through my primary education with a 504 plan that allowed me to use notes on exams and a microphone system for my hearing loss. When I graduated and got to community college, the system for accommodations was very different! I met with my advisor who had a list of options for accommodations. This is where I was introduced to transcribers andhaving what was being said in front of me in real time. It was amazing! Ididn’t have to worry about making sure I heard what was being said while tryingto capture it on paper simultaneously (trust me, it’s exhausting!). When I got to Western Washington University, the system changed on me again. This time I met with another advisor but was told that there was an online portal for putting in the service that I may need each quarter. The one thing I found challenging with this was trying to remember to do it myself while managing the quarter I was still in. The advisor would send me a reminder, but it was still a tricky thing to do when in the middle of trying to keep track of assignments. Nonetheless, I graduated with my bachelor’s degree in spring of 2018 and spent almost an entire year trying to figure out my next steps. I graduated from Fairhaven College at Western. There were no exams, the classes were entirely seminar-based and writing and reading intensive. I designed my own degree, also known as a concentration, titled: “The Tandem Traveler: Psychological Journeys and the Preservation of Memories through Place”. I conceptualized it to be about writing and working with other travelers to find different ways to help capture the memories of the experiences that are going on. I took a lot of writing, history, and art courses that touched on subjects of cultural sensitivity and awareness of the self while engaging with the world. It took me a little over six months to finally figure out what I wanted to do after college, then I found AbiliTrek through contacting a Western alumnus whom I sent my concentration to. I am very excited to be a blogger for a company that aligns so well with what I have studied at Fairhaven, and can’t wait to see where this journey takes me!